The AWARE Shark Conservation Speciality will inform you and ignite your passionate for defending sharks by inspiring you to take action to protect them. Sharks play a vital role in the marine eco system. As apex predators they help balance the population of the various ocean species they prey on. Without them prey populations would explode. Thanks to sharks, the oceans are kept healthy as ill or diseased animals end up as food, with the fittest surviving to reproduce. Sharks are also important to fishing industries, and in many locations attract dive tourists. Why Do Sharks Need Protection? 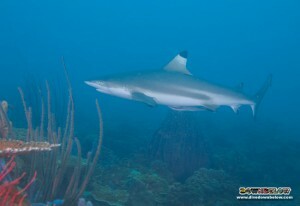 Due to overfishing for fining and as a product of bycatch, shark species around the world are under threat. European sharks, with around a third of species under threat, are under the most pressure. Legislation to regulate fisheries and trade restrictions are either non-existent or poorly implemented and needs mass action to be rectified. Sharks are popular in many cultures and education is needed to highlight the dire need for sustainability. The course contributes towards shark conservation by building awareness of the issues and inspiring students to speak out and act for sharks. To book your spot for the AWARE Shark Conservation Speciality or, if you require more information, please contact us.